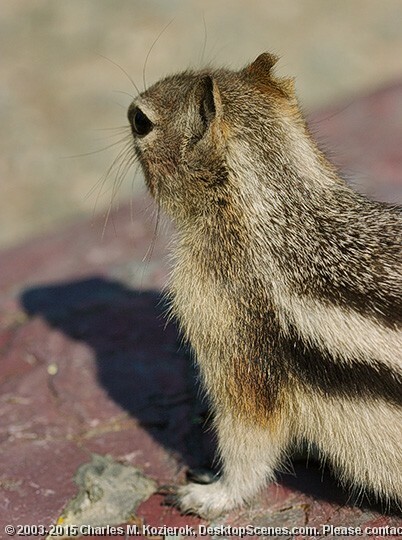 Here we have what might be considered a smaller cousin of the Columbia Ground Squirrel -- the Golden Mantled Ground Squirrel, so named for the tan or beige color of its face, neck and shoulders. This particular specimen is actually quite pale compared to others that are a stronger, almost brown shade in front, and it looks like something took a bite out of the poor fella's right ear! Many folks, especially tourists, mistake these squirrels for chipmunks; one easy way to tell the two apart is that true chipmunks have lines on their faces, not just their bodies.